Hogue Knives presents a new OTF contender with a spectacular design from Allen Elishewitz. The Hogue OTF features double-action deployment at incredible speeds using the prominent side mounted thumb slide. Its contoured aluminum handle is made with shallow finger grooves and a textured front pattern for improved grip during use. Includes a removable deep carry clip for discreet pocket carry. 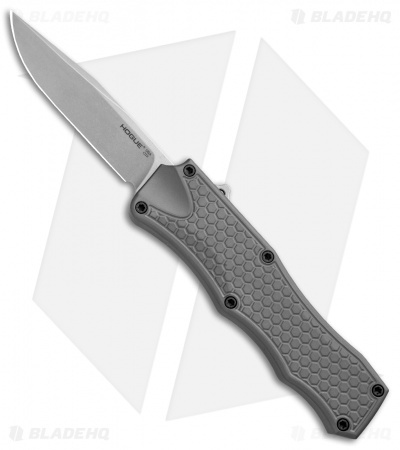 This model has a gray anodized handle and a stonewashed clip point blade. 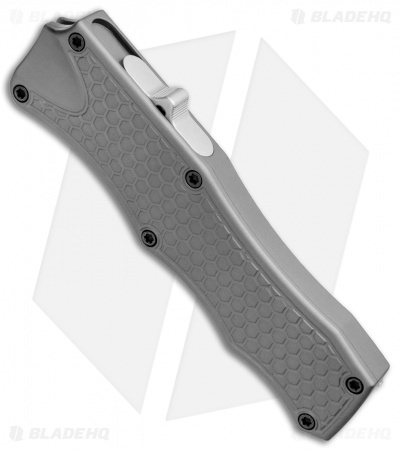 This double action OTF knife is the one I carry. 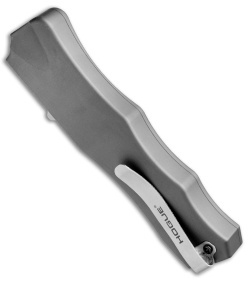 It isn't exactly light weight compared to some other OTFs available but I prefer this knife's contours and texture. I don't ever feel like my hand is going to slip on to the blade because it has decent finger grooves to get a firm grip. It takes a good amount of pressure to operate the thumb switch so there's almost no chance of accidentally deploying the blade. The pocket clip is deep carry but mine quickly bent and stuck out sometimes scraping on things. I had to bend the clip back into shape.